Sequin Backpacks Available to Order!! I’m pleased to announce the release of my sequin backpacks available to order on my Etsy site! All backpacks are designed and sewn with love by yours truly ❤ There’s so many fun colors it’s hard to choose a favorite! Hello fellow friends! I am happy to announce that I am now taking orders for custom made dresses! You can order any style pictured below as is or make customized changes to any style to make it one of a kind! All dresses are available to order through my Etsy link. 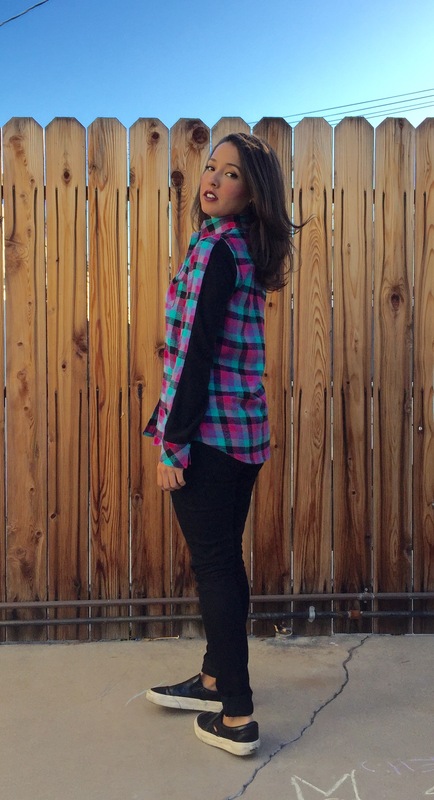 With the weather finally dropping, it’s time to bring out the flannels! I actually made these at end of last winter season and didn’t get around to blogging about them till now. Both were made with my tried and true collar shirt pattern, Butterick 5526, that I used to make my black and white gingham and my white blouse. 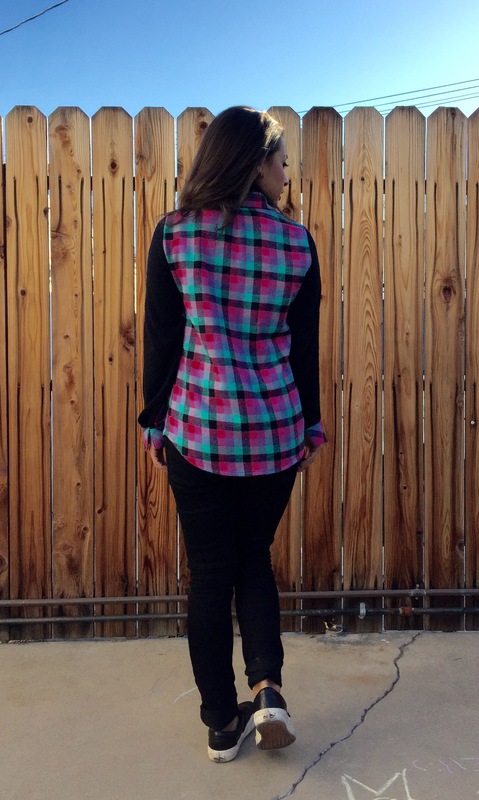 When working with plaids, I love to cut the pockets and cuffs on the bias, for a cool contrasting look. For the pink one, I only cut out one arm before realizing I didn’t have enough fabric to cut the other one. I thought about giving up on the project, but instead I cut the 1 sleeve into two and cut 1 sleeve out of a black fleece, which I cut into 2 and used as the back of both sleeves. Quick fix and I love the way it turned out! 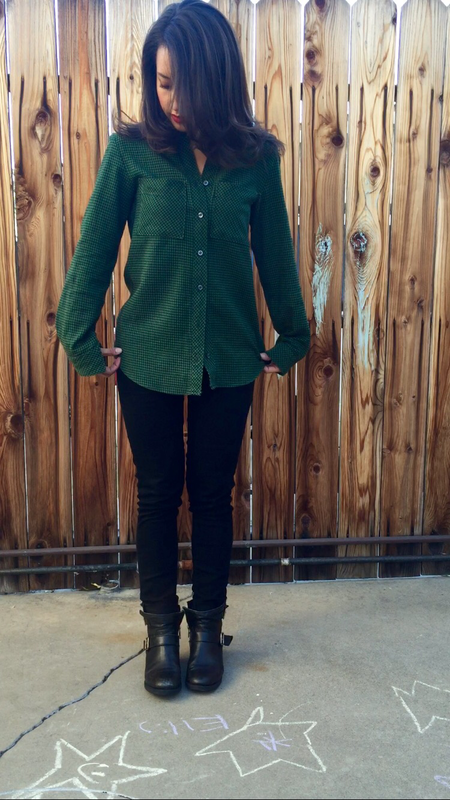 The sleeves on the green flannel came out longer than the pink version (Im not sure why…), so I like to wear this one with the sleeves rolled up. On this one, I added a back yoke cut on the bias with a small little pleat in the center. So there you have it! 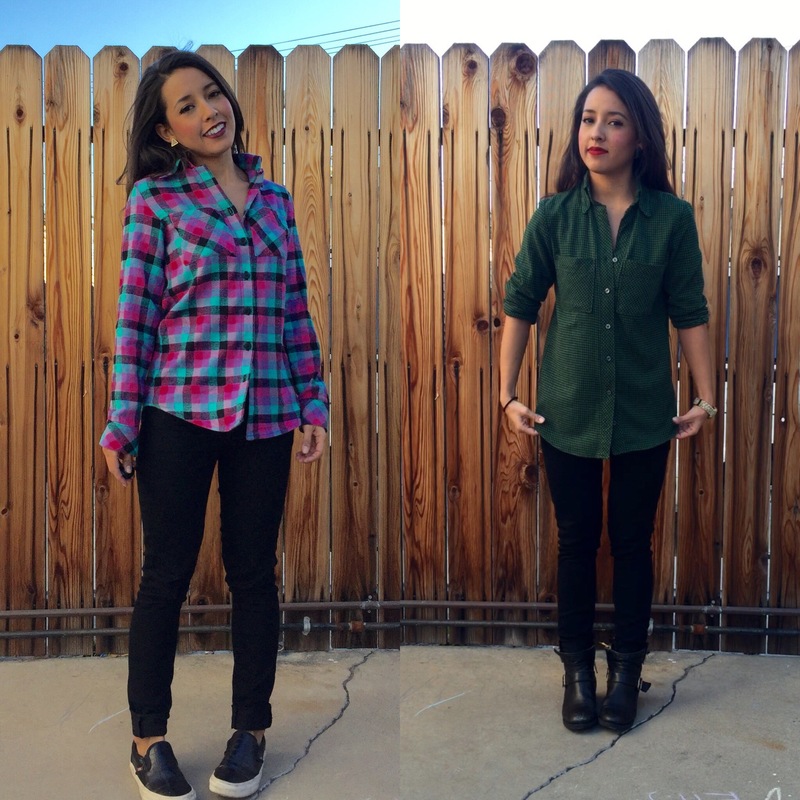 Two made by me flannels that I’ll be wearing through the cold days to come! As always, thanks for reading! PEACE! 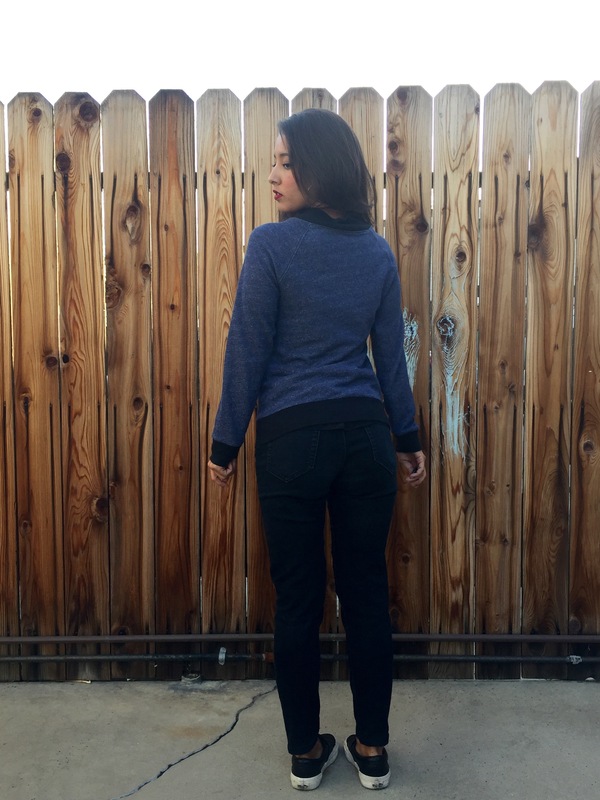 I finished this jacket a couple months ago but I didn’t wear it, let alone blog about it, until I fixed the wonky zipper last week. This is actually the first zip of sweater I have made! 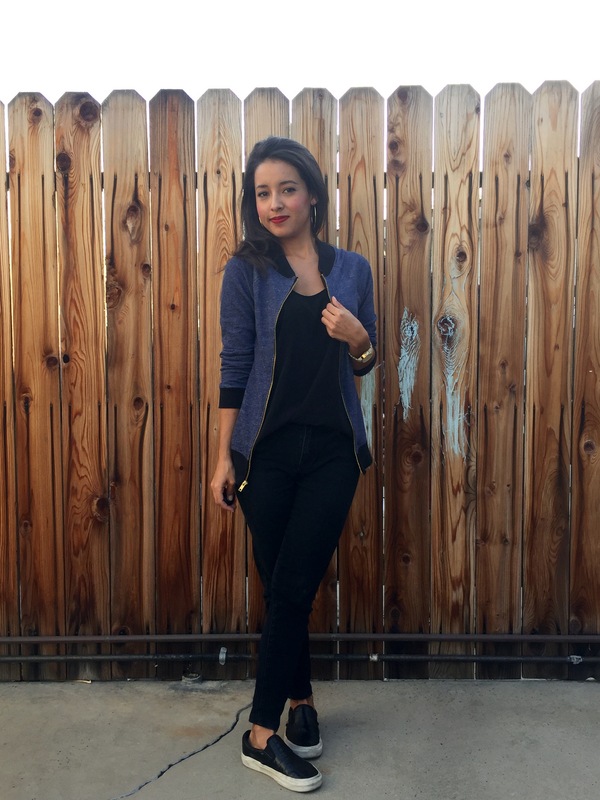 I drafted the sweater from one of my favorite leather bomber jackets. Unfortunately, when I drafted this, I didn’t use pattern paper (I was out! ), so this is one of a kind! 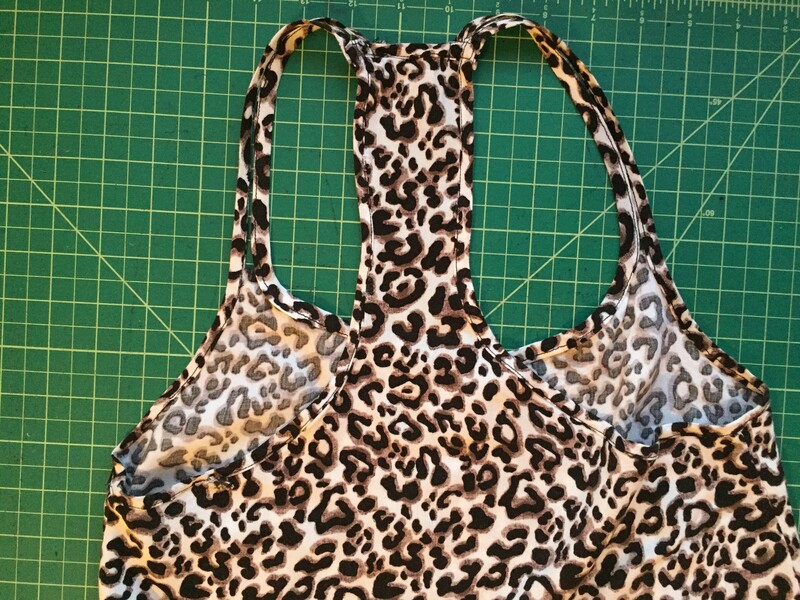 Next zip up I make, I will be sure to make a physical pattern! The French terry fabric came from a remnant sale in la and the rib for the cuff and collar was leftover in my stash. Since the f/t was from the end of the roll, you can see a slight knitting line in the back (or maybe you can’t see it!). 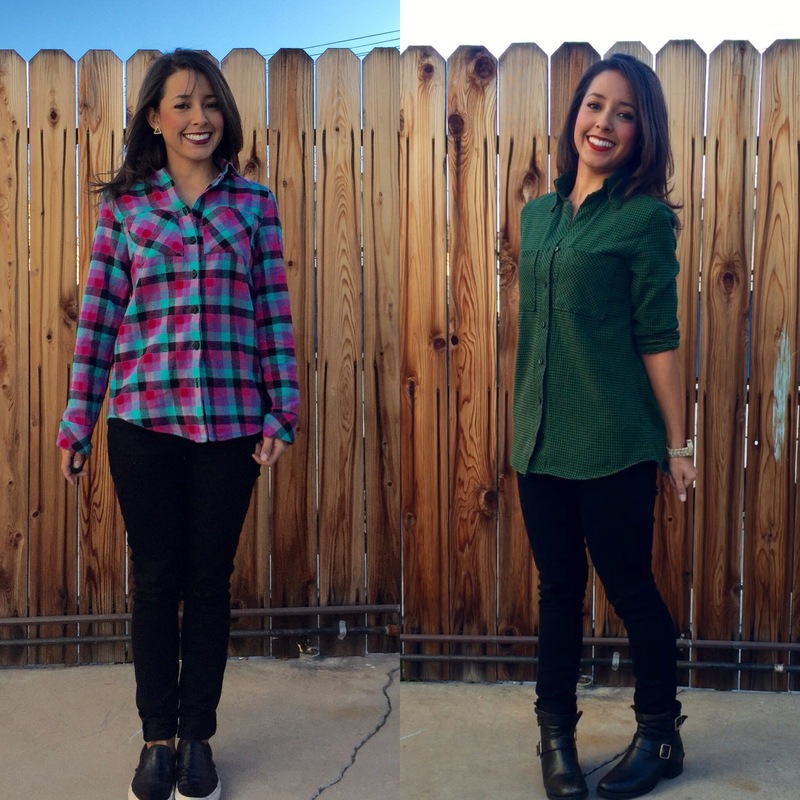 It’s definitely noticeable to me after working in the garment industry. 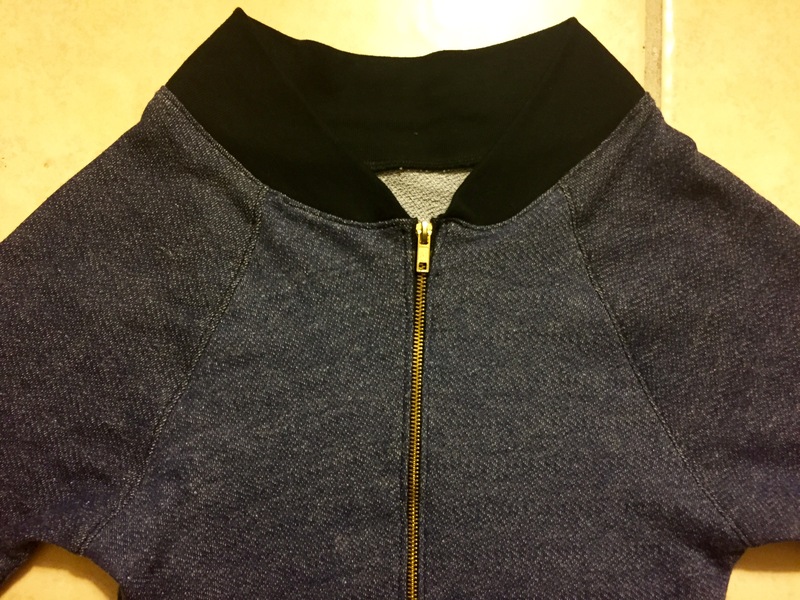 Here you can see the top stitching around the armholes and collar: And that’s my French terry bomber! 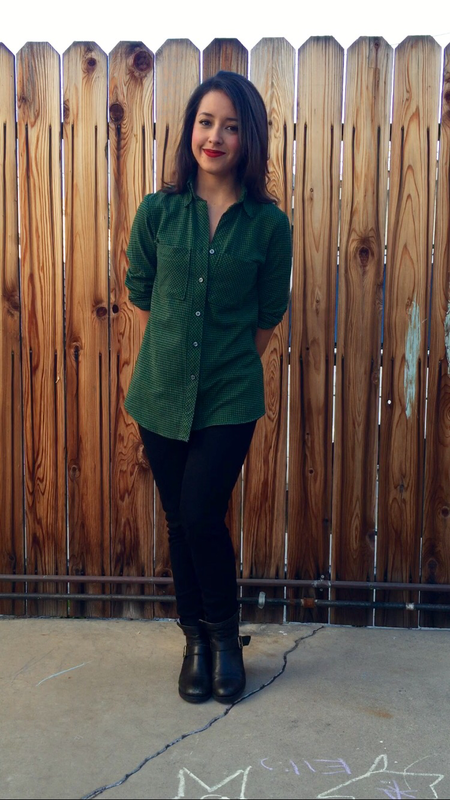 Another simple casual staple for my wardrobe! 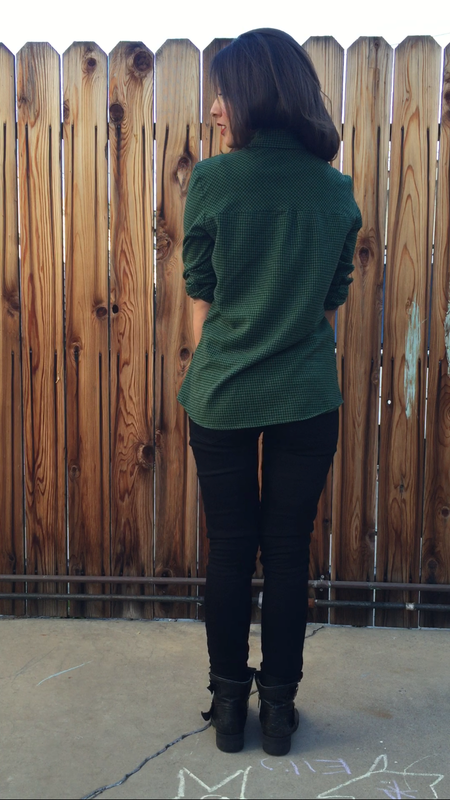 Just a quick little post on a simple sweater I made for the cooler days to come. 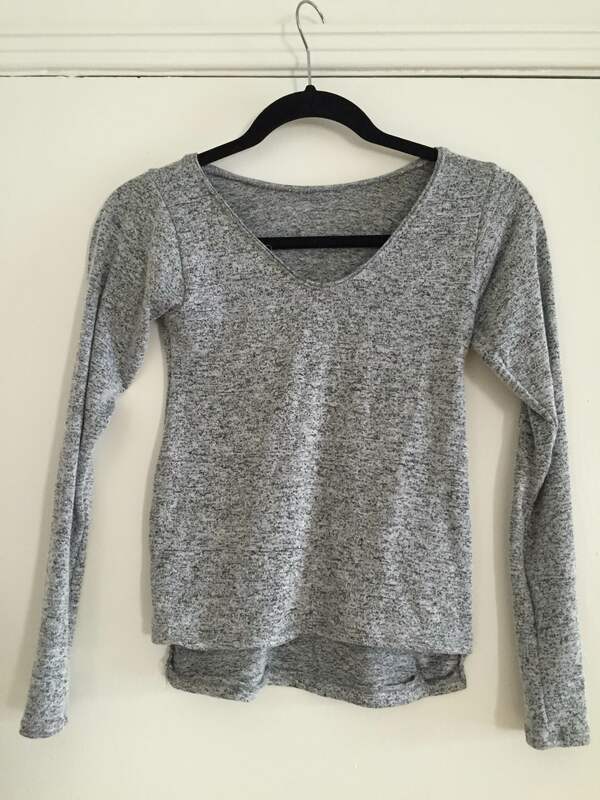 I went to the garment district in LA a couple weeks ago and purchased a lot of new fabrics – this sweater knit included! 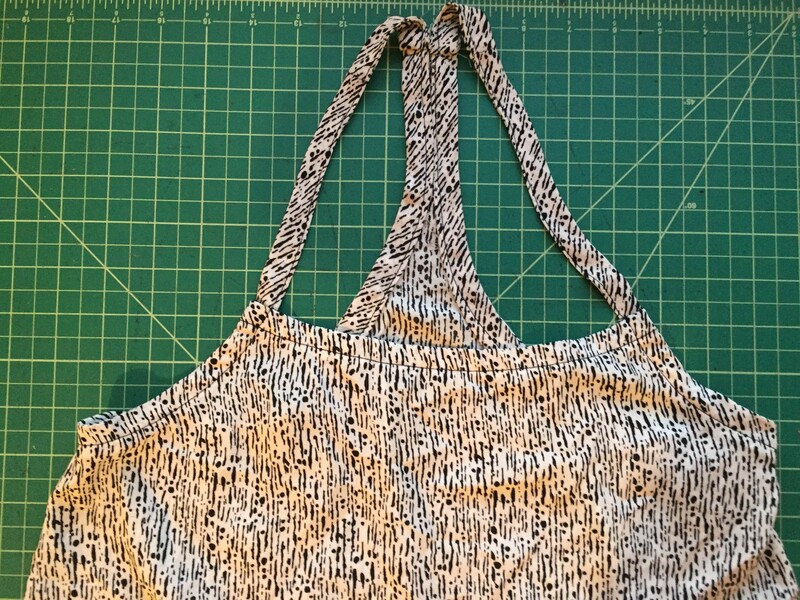 I used a body slopper that I drafted awhile back for the pattern. 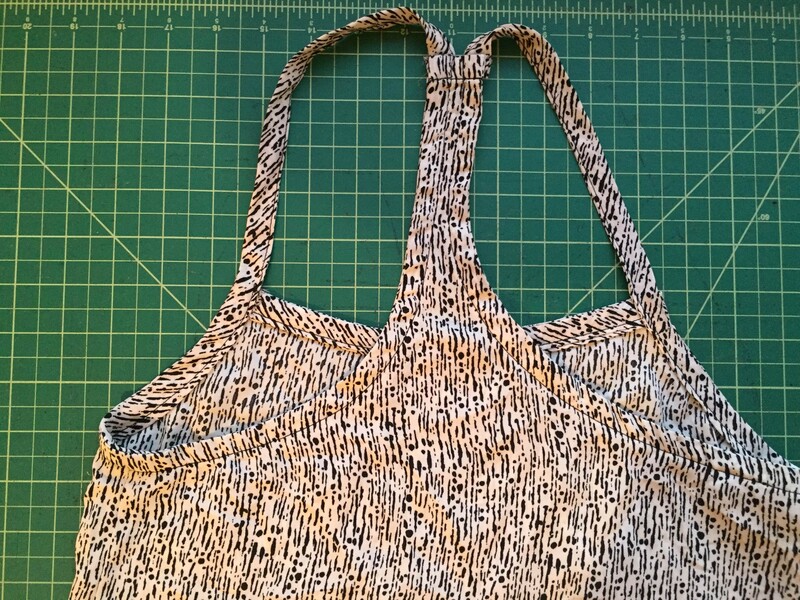 The neckline is finished with a 1/8″ neckband that I top stitched with a single needle chainstitch. The hem is slightly longer in the back than the front. This was done on accident and I kinda like the way it turned out! I wore this sweater all day, that’s why it looks all stretched out. And that’s all she wrote! Thanks for reading! Although summer has officially ended, temperatures here in Southern California have ceased to drop. Thus, it is still necessary to sport my tanks n’ shorts. The fabric is a rayon challis that was actually about to be thrown out at work, as it was barely 1/4 yard. Accompanying the almost discarded fabric was a long strip of 1″ wide bias binding, which was perfect to make the straps and neck/armhole binding. Per usual, I made this by using the body of a garment I knew fit me and cut around that on my fabric. (the fabric of the garment was similar to the one I was cutting). The double straps just came about as I was playing with the placement of the bias binding – functional and fashionable! If you couldn’t tell from the first photo, here’s a closer shot of the double straps. I made this tank back in July and it’s definitely one of my favorite crop tops to wear with high waist pants. So much so, that I made an identical one in a polyester “spray print” (that’s what I like to call it because it’s crazy and wild!). This is basically the same except the binding is wider and single strap. This version also has a little more high-low action going on vs. the other one. I’m bummed summer is coming to an end but that only means there is fall/winter sewing on my horizion! This dress started as a muslin (a first fitting) for my black everyday tank dress. I used the same staple knit dress as a base pattern, changing just about everything but the body shape. The jersey that I used didn’t have as much stretch as the original dress, so my version came out slightly tighter and shorter than what I’m accustomed to. Since the jersey was so thin and see through (I think it’s a polyester/ cotton blend), I layered the body THREE times!! This fixed the opaqueness of the fabric and gave it a nice heavy weight. Next problem to solve was the length. 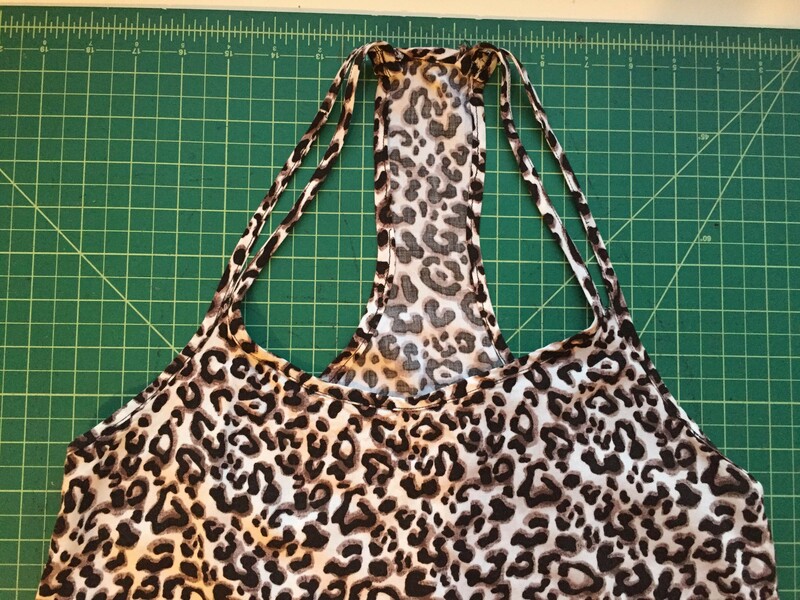 I left this hanging in my room for weeks before I decided what my next move was going to be – add a flounce at the bottom hem to match the top of the dress! The top flounce works as a facing and cleanly finished the neck and armhole edges. I made it by tracing the top part of the dress (no longer than the waist), onto paper, marked a couple inch notches at the bottom of the paper, and slashed/ spread, just like I would when adding volume to a circle skirt. The hem of the top & bottom flounce are rolled on the serger. I have yet to wear this dress, but I see many opportunities within the near future with the weather only getting hotter as we approach August! 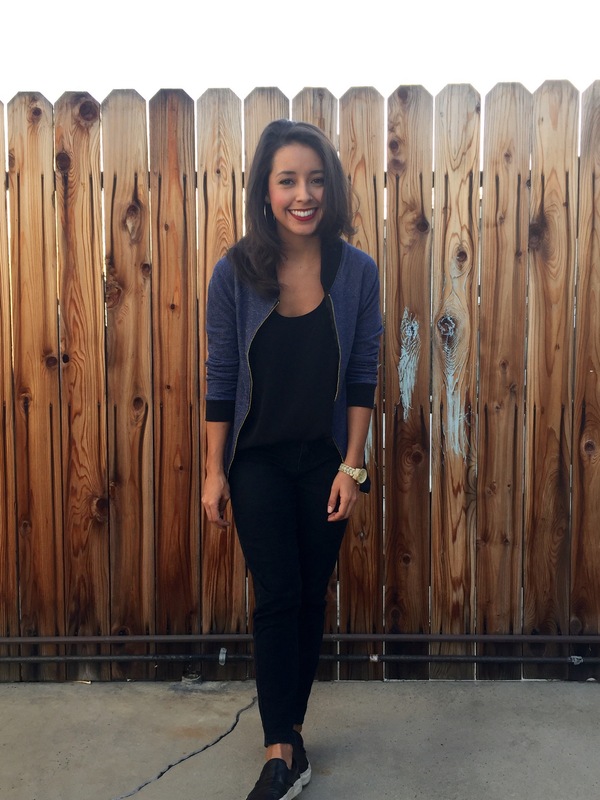 On a side note, for those of you who may have ready my ABOUT… ME! section, you know that I LOVE hip-hop. I absorb my musical intake from SoundCloud, and recently, I discovered this AMAZING station – Soulection Radio. They mix old sounds with the sounds of tomorrow. It’s all about the good vibes and that’s what I’m all about. I highly recommend checking it out!